Can Religious Groups Ignore All Laws They Don’t Like? Or just those related to women’s health? That’s the big question raised by Zubik v. Burwell, the fourth challenge to the Affordable Care Act to reach the Supreme Court. At issue is a regulation requiring all employer-provided health plans to cover birth control. Some religiously affiliated nonprofits—schools and hospitals, for instance, and a group of nuns called Little Sisters of the Poor, which runs nursing homes—objected to the mandate, so the Obama administration offered them an accommodation: they could opt out of providing contraception coverage by filing a form stating their religious opposition, and the government would work with insurers to provide it. The plaintiffs in Zubik v. Burwell argue that even filing a form makes them complicit in the process of providing birth control and, accordingly, violates their rights under a federal law called the Religious Freedom Restoration Act. Paul Clement, one of the lawyers for the plaintiffs, argued during Wednesday’s hearing that the opt-out process was akin to setting up a clinic that offered birth control in a nun’s home. It amounts to a “hijacking” of their health plans, he argued, a phrase later parroted by Chief Justice John Roberts and Justice Anthony Kennedy, who is likely to be the swing vote in the ruling. The objection to the accommodation, specifically, is part of what differentiates Zubik from 2014’s Hobby Lobby case, which involved for-profit corporations whose owners also objected to the mandate on religious grounds. In Hobby Lobby the Court ruled that that the companies didn’t have to pay for birth control coverage. But it left open the possibility that the government could provide an accommodation similar to what it offered the nonprofits. Now that option is in question. If the religious nonprofits win their case, it means Hobby Lobby, a craft-store chain, and other corporations who object to it would likely be able to fully deny contraception coverage, too, which could impact many more thousands of women. 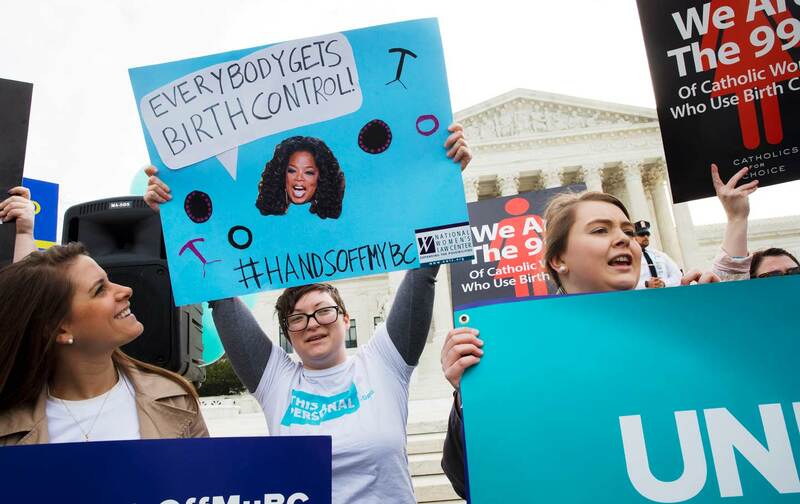 A main point of contention during Wednesday’s arguments was which group would be most burdened: religious groups, in filling out an opt-out form, or female employees who might face bureaucratic hurdles if they’re forced to obtain contraceptive coverage through other means. Justice Samuel Alito implied women could simply get contraception through an alternative arrangement. “Suppose that it were possible for a woman who does not get contraceptive coverage under…a plan offered by a church or under a plan offered by a religious nonprofit to obtain a contraceptive­ only policy free of charge on one of the exchanges,” he suggested. Kennedy wanted to know, “If [birth control is] so easy to provide, if it’s so free, why can’t they just get it through another plan?” Roberts, too, insisted that women could just get contraception-only plans on the insurance marketplace. The female justices and Solicitor General Don Verilli then had to explain to Alito, Kennedy, and Roberts how women actually get contraceptives. Such tailored policies don’t exist, Sotomayor noted, so what her colleagues were really suggesting was setting up an entirely new insurance program for women whose employers deny them coverage. And there’s no guarantee doctors would work with those new plans. “Even those small barriers work as a sufficient disincentive that many fewer people use contraception,” Verilli argued. On the other hand, the Obama administration has already lessened the burden on religious groups. “There has to be an accommodation, and that’s what the government tried to do,” said Justice Ruth Bader Ginsburg. Kennedy gave mixed signals as to his leaning. In a separate opinion he wrote in the Hobby Lobby case he affirmed that the government has a compelling interest in providing contraceptive coverage. But on Wednesday he expressed concern that the accommodation would make the nonprofits “complicit in [a] moral wrong.” Yet he also indicated at least some sense of discomfort with the slippery slope. “It’s going to be very difficult for this court to write an opinion which says that once you have a church organization, you have to treat a religious university the same,” he remarked. “I just find that very difficult to write.” A four-to-four split opinion means lower court rulings would stand. Eight of the nine courts that considered the arguments against the mandate rejected the idea that filing the opt-out form violates religious liberty. How far must a secular government go to accommodate religious groups, and what makes a burden on religious practice “substantial”? “I’m trying to find the basis for the distinction between those things that we do require people to do despite their religious objection and those things that we don’t,” said Justice Stephen Breyer. “I don’t think there’s a clear line,” Noel Francisco, another lawyer for the plaintiffs, acknowledged. Throughout the country, religious and conservative organizations are trying to draw the line in a way that allows them to deny services or otherwise discriminate against other groups, particularly women and LGBT people. More than 100 bills have been introduced so far this year in state legislatures that cloak anti-LGBT bias in the guise of religious freedom. On Wednesday, as the Supreme Court debated the birth-control mandate, lawyers for the ACLU in Michigan were in court in a case against Catholic hospitals who they say have put pregnant women’s lives in danger by refusing to provide emergency abortion care. When the Supreme Court issued what the majority called a “narrow” ruling in favor of religious corporations in the Hobby Lobby case, Justice Ginsburg warned it was really a “a decision of startling breadth.” She wasn’t wrong: It encouraged broader claims for religious exemptions. This time the Court could decide to define some limit to objections made on the grounds of faith, but it seems more likely to leave the line blurred.